The era of the quad-cores has begun. Everyone is slowly getting on the quad-core bandwagon. But, the stars of quad-core currently are HTC, LG and Huawei. What remains to be tested is which one is the best quad-core smartphone. Well, we provide you a comparison between these on the basis of 4 major factors: Processor, display, OS and camera. A processor is indeed the heart of us to get the phone. It is what enables us to make the best of every function and every app. A good processor is one of the benchmarks of a good phone. Quad-core processors definitely take it to the next level in the mobile arena. They endow your device with the special power of superfast performance. The HTC One X is endowed with a 1.5 GHz processor, which uses ARM’s Cortex A9 architecture, and NVIDIA’s Tegra 3 processor. In addition to that, it comes with a 12-core GPU giving it access to superior graphics. This setup uses what is known as the 40-nanometer technology, in addition to having a 64 KB L1 and 1 MB L2 on board. The whole thing makes One X a powerhouse smartphone. The LG Optimus 4X HD uses an identical setup. It comes with a 1.5 GHz Tegra 3 processor. Just like the HTC One X, the powerful 12-core ULP GeForce GPU. Huawei though has opted for a completely different setup. Instead of depending on NVIDIA or Qualcomm, it has developed its own chipset called the Huawei K3V2, which is based on the trustworthy TI OMAP with Cortex A9 architecture. What puts it ahead of heavyweights like the One X and 4X is definitely its 16-core GPU. While the processor is clocked at 1.5 GHz using 64-bit 40 nanometer technology. Big displays are totally in vogue. After recently, using the Sensation XL, we would say that 4.7-inch is kind of the perfect size, although we don’t really mind a 4.5-incher even. All three phones boast of a 1280 x 720p display, which gives the Ascend D Quad kind of an edge, since with a smaller screen size, its display density (326 ppi) is better than the HTC One X (312 ppi) and LG Optimus 4X (312 ppi). Based on the specs, the LG Optimus 4X has better display than the HTC One X, since it uses a superior IPS display, But one can’t underestimate HTC’s display too. All three phones boast of the latest Android iteration – the Ice Cream Sandwich OS. It is a big step up from Android 2.3 Gingerbread OS. But the thing is, HTC One X comes with the new Sense UI while the LG 4X boasts of the new Optimus skin. Basically, Sense is the friendliest UI amongst all and from what we have heard, works quite well with the ICS. All three handsets have an 8-megapixel snapper at the back and a 1.3-megapixel-fromt camera, but the HTC One X is equipped with the ImageChip technology which shows RAW images before converting them into JPEG. HTC is clearly the winner in the camera department. Final Verdict: There is a winner here we hadn’t anticipated before writing this piece. 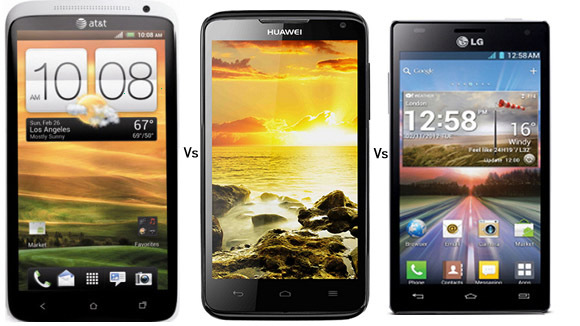 On the basis of the above comparison, we believe that the Huawei Ascend D Quad XL beats the HTC One X and LG Optimus 4X hands down.